This isn’t strictly about food but I’m pretty happy about this little bit of news. At some point in the second semester my magazine journalism lecturer asked our class to do an exercise in colour writing. I think maybe three out of 14 or so chose to do it. Our reward? Getting published in Sunday magazine, which is part and parcel of one of our Sunday newspapers, the Sunday Star Times. 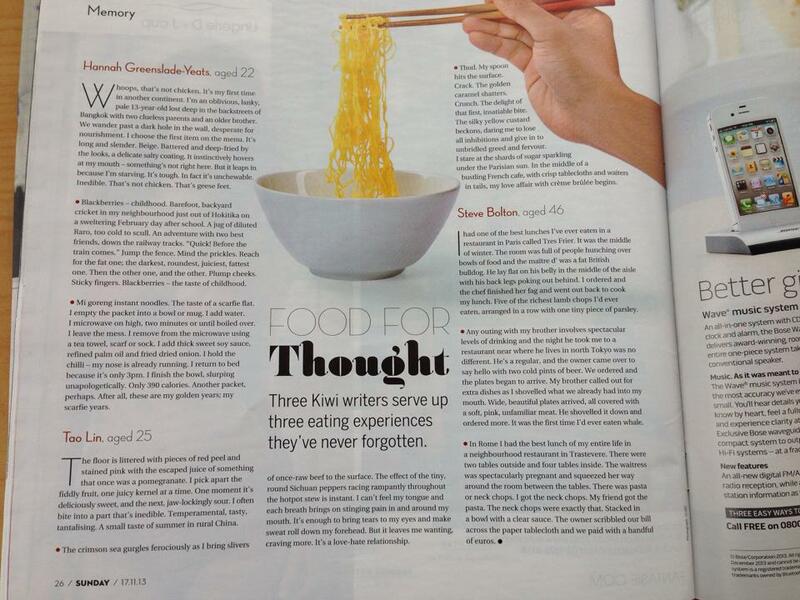 This is the first time I’ve been published in something as nationwide as this so I’m fairly stoked! You know the semester’s hit when my blog goes quiet for 2 weeks and then resurfaces with no cooking – just links to food-related blog posts, articles, websites, etc. However, I will be doing some cooking this weekend, if all goes well, and you can’t say I haven’t been trying to keep this ball rolling! Anyway, I just came across a lighthearted Tumblr blog while writing/procrastinating from writing my first-speaker speech for a debate on Thursday: Hot-Dog Legs. Are they legs or just hot dogs? Do these supposedly gag-inducing photos of fast food not actually look that bad…? 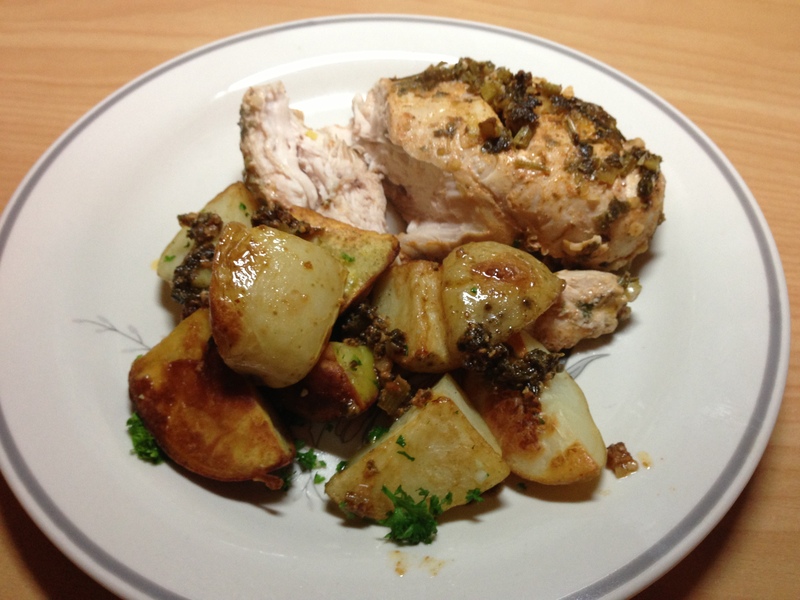 In my last post I wrote about my enthusiastic use of lemon juice in making lemon herb chicken. I decided to try it again with a lot less lemon to see what it would taste like and not surprisingly, it went down with a lot less puckering. I used less than half the amount of lemon juice I used the first time but you could definitely still taste it. It’s a keeper for sure but now that I’ve almost used up all the parsley, I’m keen to try something different next time. Just came into work 5 minutes ago, opened my Twitter feed and the first thing that catches my eye is the word “cronuts”. What the heck are cronuts?? Well, apparently I’m a little slow on this bandwagon (but then again, I do live way down near the bottom of the southern hemisphere) but they’re half croissant, half donut creations of Dominique Ansel. As I Google “cronuts”, I discover that they were first released in May 2013 and not only are these pastry-licious creations incredibly popular, they are so popular that there is now a scalping problem. I’ve had a look through Mr Ansel’s other creations and they all look incredibly delicious – worth a trip to NY for sure! Looking for stuff I can make with tahini – because I have a big jar of it – I came across a recipe for Tao hummus. Is that legit?? Sitting on my bed, sipping green tea and trying to digest my pot pie and two servings of dessert before falling into a satisfying state of deep sleep, I’m thinking how whenever I catch up with my friends all we ever seem to do is eat. I know a couple of people who would find that completely bizarre – surely we’re capable of sharing girly gossip and our insights into war, love and peace without hovering over a menu or plate freckled with the left-over bits and pieces of our meals, right? Actually, I’m fully of the view that food brings people together. Of course, people bring people together – I don’t think any amount of fine food would ever be worth unpleasant company – but good food plus good company is a winning combination. Call me old-fashioned but I still eat dinner at the table with everyone and it’s such a nice thing to do because it’s one of the few times everyone is together in the same room, doing the same thing and connecting (most of the time!) with each other. My mother always says it’s good company that makes food taste better. 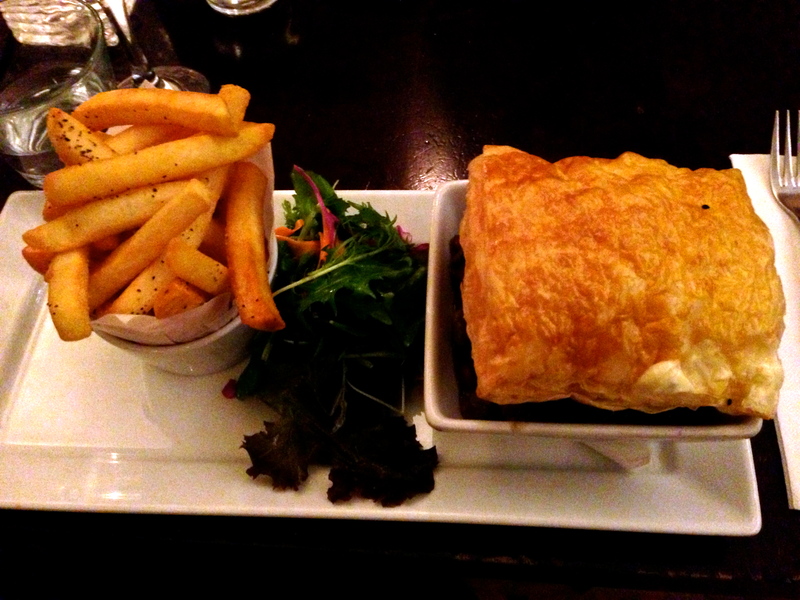 Anyway, the night started out at Mission Bay Cafe with a steak and mushroom pot pie for me. I love pie, I love beef but I’m not a huge fan of mushrooms, at least not button mushrooms – go here if you want to know more. So I ordered it, knowing that I’ll probably end up forcing the mushrooms down since I don’t like wasting food but I was very pleasantly surprised when I dug into the pie to find juicy slivers of shitake mushrooms, which are only some of the best mushrooms, in the world, ever (no journalistic notions of fair and balanced reporting here). As you can see it was a slight variation on the pot pie, with a lovely piece of really golden, crispy, puff pastry sitting on top of the filling. The fun really began though when somehow, for some reason, we thought it would be a good idea to head into town and visit not just one but a few different yoghurt/ice cream places. This was definitely a case of us ladies being able to find a second stomach somewhere especially for dessert! There’s been a huge increase of yoghurt places, where you choose your own yoghurt(s) and make what could actually be something very healthy into something very not healthy by adding lots of sugary toppings. The most popular one here is KiwiYo, which I enjoy because it’s fresh, fun and youthful but just quietly, this place we went to tonight had better yoghurt, although not as many toppings to choose from. 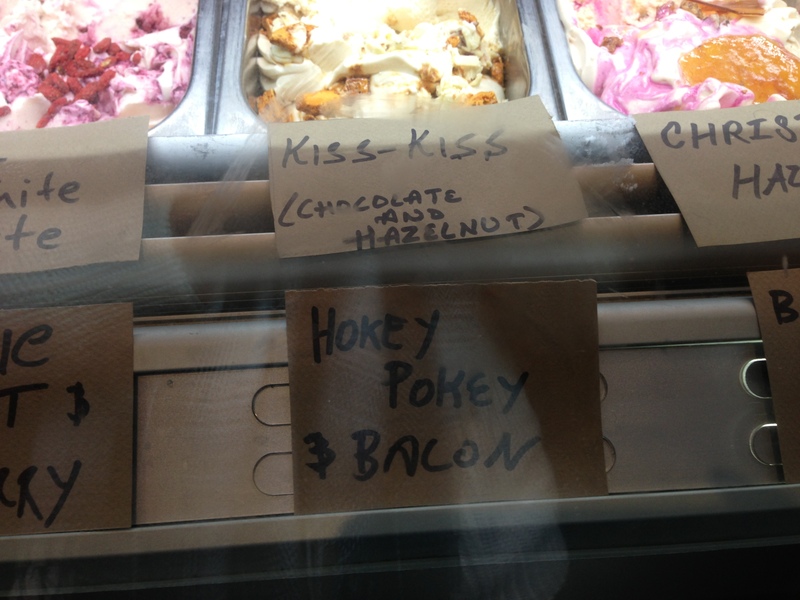 Hokey Pokey and BACON? Not sure I’m convinced on that one (probably means it tastes surprisingly good). Anyway, I had salted caramel (a-ma-zing) and my friends had chocolate brownie, banoffee and chocolate. Let me tell you, that chocolate brownie flavoured gelato tasted incredible – it was like eating actual chocolate brownies. I know that sounds stupid – of course it should taste like you’re eating chocolate brownies – but I’m often disappointed at how some flavours of things don’t resemble what they claim to taste like at all or worse, it tastes completely artificial. Banoffee tasted like banana smoothie and probably could have done with a bit more of a toffee flavour. 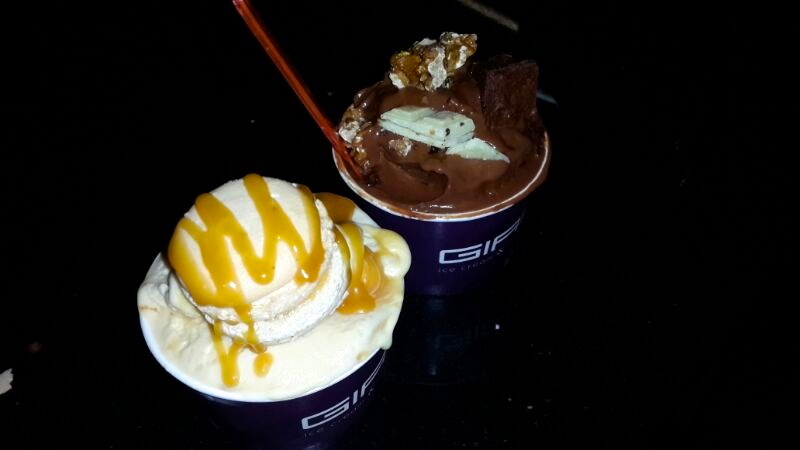 The chocolate one was covered with hazelnut topping and you know what? It was like a giant ball of deliciously creamy Ferrero Rocher filling – so good! It was a great girls’ catch-up, with the best company all brought together by a love of (eating!) good food. In other news, I’m planning on making creme caramel tomorrow. Here’s hoping I can stomach dessert by then!